Friends of the Earth has called on the Government not to increase the carbon tax as a stand-alone policy, but to include it in a comprehensive “Green New Deal” with Government taking the lead on cutting emissions and making less polluting choices affordable and accessible for people. The call comes as Minister Bruton holds a high-level consultative forum on his proposed new all-of-government climate action plan this week, and the special all-party Oireachtas Committee on Climate Action prepares its final report by the end of the month. “The carbon tax won’t work if people feel the Government is pushing responsibility for climate action onto individuals. The Citizens’ Assembly was crystal clear that people want to see the Government take the lead. “It’s not enough that the tax itself is done in a progressive way that protects the vulnerable, the Government has to make less polluting choices as affordable and accessible for people as possible, and it has to be seen to be doing that before the carbon tax starts to rise. “Friends of the Earth has today outlined the key elements of a Green New Deal that would enable people and communities to drive a just transition to a zero carbon future. “These include an SSIA-style scheme for insulating homes, a ‘Tipperary Energy Agency for every county’, solar panels for every school and a payment for the solar power that communities and farmers supply to the grid, low or zero fares for buses, trams and trains, and new investment in public transport, cycling and walking. “We support the Government’s suggestion of a ‘carbon tax-and-refund’ scheme where the increase in the carbon tax would go straight back to people as an equal lump sum ‘cheque-in-the-post’. If you spend less than the average person on polluting things you end up with a cash bonus. If you spend more than the average person on polluting things you end up out of pocket. “Less well off households spend less on average than richer households on polluting goods so they end up a little better off under a carbon tax-and-refund scheme. “We all still face a price signal, polluting products get more and more expensive, and you will save money if you choose the a less polluting option, but as we make the transition we protect those most vulnerable and those for whom the less polluting choices are not readily available. “The key though is for Government to lead on making less polluting choices accessible and affordable for people. That’s what a Green New Deal can do”. Householders also need project management support to figure out what they need to get done and what contractor to trust to do it and at what price. The Tipperary Energy Agency has built up an unrivalled capability and reputation for doing that well in a way that appeals to people (it’s about warmer homes, with healthier air and lower bills as much as lower emissions). We need to scale up the same capacity in every county in Ireland, with a support agency that has the reach, the resources and the trust to deliver, modelled on the success of Tipp Energy. Whenever a US multinational announces it is closing a factory, overnight the Government sets up a taskforce with the state agencies to support the workers find new jobs. We have known for 20 years that we have to stop burning coal and peat for electricity and Government is still dragging its heels. We need a Just Transition Taskforce now, with representatives from the unions, the ESB and Bord Na Mona, all the state agencies, NGOs like Irish Rural Link and local community development representatives. It needs to have the resources and the authority to support the affected workers, and their families and communities, to plan for a sustainable future and realize it. Transport is the area our pollution has risen fastest. We should implement the very simple Citizens’ Assembly recommendation that 1/3 of the transport budget should go on roads and 2/3 should go to public transport, cycling and walking (reversing the current ratio). And we should implement the UN recommendation that 20% of the transport budget should go to enabling safe cycling and walking (less than 2% does now) as that also tackles obesity and promotes healthy lifestyles. We support the suggested ‘carbon tax and refund’ scheme where the increase in the carbon tax would go straight back to people as a equal lump sum ‘cheque-in-the-post’. If you spend less than the average person on polluting things you end up with a cash bonus. If you spend more than the average person on polluting things you end up out of pocket. 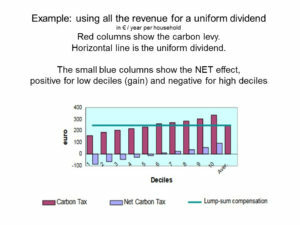 Less well off households spend less on average than richer households on polluting goods so they end up a little better off under a carbon tax and refund scheme.